Summer Season Plans | Mezashite! It seems we haven’t made a post about this season’s plans, and since we’re working on the first episode already, I figured I should probably announce it. 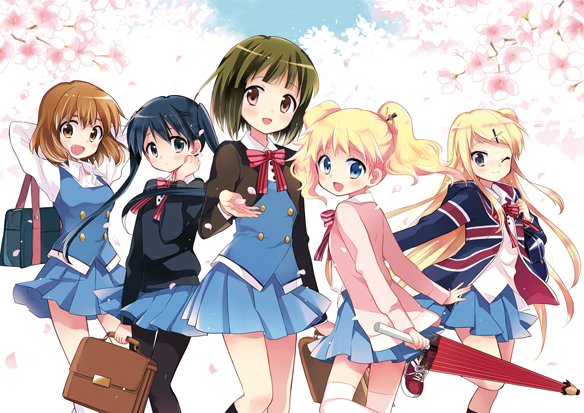 We’re doing Kiniro Mosaic (which translates kinda to “Golden Mosaic”). The first episode will be delayed until approximately 24 hours from now because Akatsukin is really high right now. Akatsukin is stuck in the San Francisco airport because of the crash, so we… don’t have typesetting. And the script hasn’t been edited yet. Also, “they” have been suggesting the existence of a second Aikatsu season. Nothing’s confirmed though, so who knows. lol sorry, I’m just enjoying things, srsly, when your favorite anime gets second season, that’s what I saw in fb….. I hope a second season would be some sort of direct sequel and not just another member of a franchise, like the Precures or Pretty Rhythm series. Yurika-sama has high expectations about this anime. Looking forward to your work! I hope there really is a second season. I’m just glad that Akatsukin is alright with him being so near to such a thing. I look forward to more of your works guys.